The death occurred on Friday, March 8 of Joan Stephenson, Glover’s Court, Dublin 2 and late of Augherea, Longford. Sadly missed by her daughter Sarah, son-in-law Crizan and grandson Matheo, sisters, brothers, sisters-in-law, brothers-in-law, nieces, nephews, relatives and many friends. Rest In Peace. Reposing in Fanagan's Funeral Home, 54 Aungier Street, Dublin 2, on Monday, March 18. Family in attendance from 2pm until 5pm. Private service and cremation in Mount Jerome at 3.30pm on Tuesday, March 19. The family would like to express their heartfelt gratitude to those who have expressed sympathy but respectfully ask that only direct family and close friends of Joan attend Mount Jerome. 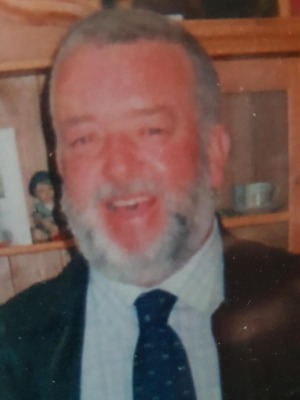 The death occurred, in Tullamore General Hospital, on Thursday, March 14 of Noel Garry, 13 McHugh Park, Kenagh, Longford and formerly of Lacken, Multyfarnham, Co Westmeath. Predeceased by his parents John and Betty and his brothers Joe and Ted. Noel will be sadly missed by his loving family, his long time partner Margo Nolan, his son Roy, daughters Rebecca and Lisa, their mother Nuala, brother Desmond (England), sister Maureen (England), sister-in-law Stella (England), son-in-law and grandchildren. Margo's children Siobhan, Tracey, Karl, Thomas, Gary, Darren and Damian, nephews, nieces, relatives, neighbours and his many friends. Time passes, Love remains. Rest in peace Noel. Reposing in Connell's Funeral Home, Church Street, Longford (N39 KN66), on Monday, March 18 from 6pm concluding with prayers at 8pm. Removal arriving to Lakelands Crematorium, Dublin Road, Cavan on Tuesday, March 19 for cremation at 11am. Family flowers only please, donation if desired to Tullamore General Hospital c/o Connell Funeral Directors or any family member. Parking for Connell's Funeral Home is in Connolly Barracks. The death occurred, in his 94th year, at his home, in the loving care of his family, on Saturday, March 16 of Norman (Frederick Arthur) Moore, Arva, Cavan, ex Bank of Ireland. Much loved husband of Sighle and loving father of Declan, Ronan, Kieran, Fiona, Gary, Siog and Barry; sadly missed by his sister Eíthne, brother Maurice, sisters-in-law Jenny and Sigbrit, daughters-in-law Síobhan, Ann and Sheena, grandchildren, great-grandchildren and a wide circle of friends. Funeral Mass on Monday, March 18 in the Church of the Sacred Heart, Arva at 12 noon, followed by cremation in Lakelands Crematorium, Dublin Road, Cavan. No flowers please. Donations in lieu to Irish Cancer Society. The death occurred, peacefully, in the loving care of all the staff at Shannon Lodge Nursing Home, Rooskey, on Saturday, March 16 of Annie Kelly, Cloonakilla, Strokestown, Roscommon. She will be sadly missed by her cousins, her good neighbours and friends. Rest in Peace. Reposing at Shannon Lodge Nursing Home on Monday, March 18 from 4pm until 5pm, followed by removal to the Church of S.S Eithne & Fidelma, Tulsk, to arrive at 6pm. Funeral Mass on Tuesday, March 19 at 11am. Burial afterwards in Kilcooley Cemetery.